Tom celebrates his 20-ish birthday at Santa Clara University. It so happens at AOD is up and running. Our first Cherry Blossom parade. It's HOT, HOT, HOT! This time, we got some MidWesterners at this joint. And other crazy summer adventures. In 2004, marked settling into San Francisco. Thus, it meant more opportunities to attend the regular bay area conventions. 2004 was a great year for bay area conventions and cosplay related events. Anime Overdose, Cherry Blossom Fest, and Tales of Anime just to name a few. Aside from retro pink Fujiko, no huge cosplay debuts for 2004. Just a few simple ones from Goodwill raids (Hotaru Tomoe, Michael Corleone, Ayumi Hamasaki, etc). Famous Ray's con in sunny San Francisco. Rumor has it that Rick James' spirit wanders the hotel grounds. 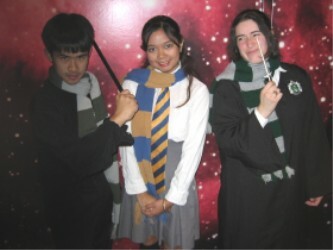 Two Slytherins up against one Ravenclaw. OMG?! Is Victoria crossplaying? Traveling Valentine does it Sicilian style. Careful, you may have so much fun that you never want to leave.